I have been to Glasgow twice before, but I don’t think I can claim those as ‘visits’. Once was in 2008 on a day trip to a head office of a furniture company I worked for, and once in 2006 where I forced a Tim to walk around an empty Glasgow Central Station with no shoes on. Long story. 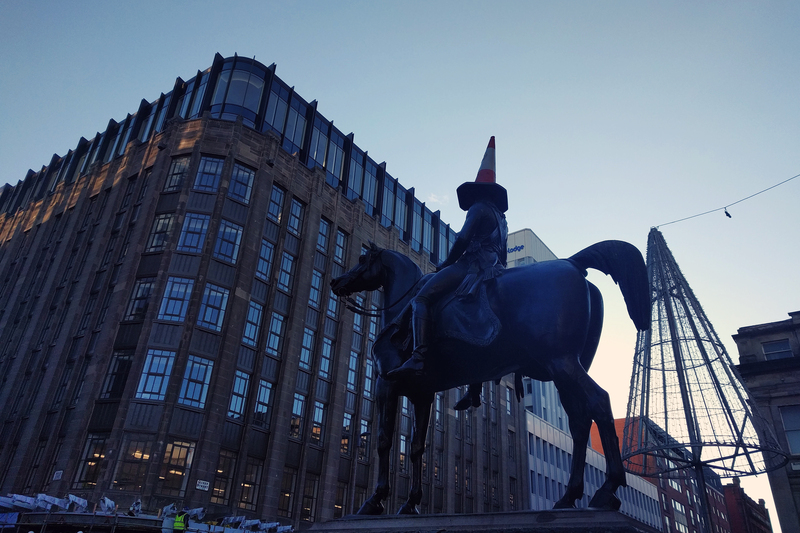 I don’t feel I really got a sense of the city on either of those occasions, so I decided to claim this visit as my first proper trip to Glasgow. No tram trip for us today, although we could have used the Glasgow Subway to add to our unusual transport quota. Instead we parked just outside the city centre and walked in, seeing some amazing street art on the way. We’d left Dunmore fairly late that morning as we’d spent some time photographing our Pineapple, so we got to Glasgow pretty much for lunchtime at Taste Buchanan. Now, the idea of mall food isn’t traditionally inspiring, but Glasgow’s Buchanan Galleries have taken the concept of pop-up, independent street food markets and applied it to their food court. At the time we visited, we could have chosen from pizza, hot dogs, tacos, plus other things that I’ve forgotten about – they change vendors every three months so it’d be impossible to get bored. We all went for Surf Dogs, and I watched as there seemed to be some kind of blogger/social media flat lay photo shoot going on behind us. This was a very Instagram worthy eatery. Kudos to Glasgow – what an inspired idea for mall food. Onto the reason for our visit. I’ve already mentioned a previous trip to Glasgow Central Station 10 years ago, but fortunately this time, I didn’t make Tim take his shoes off. 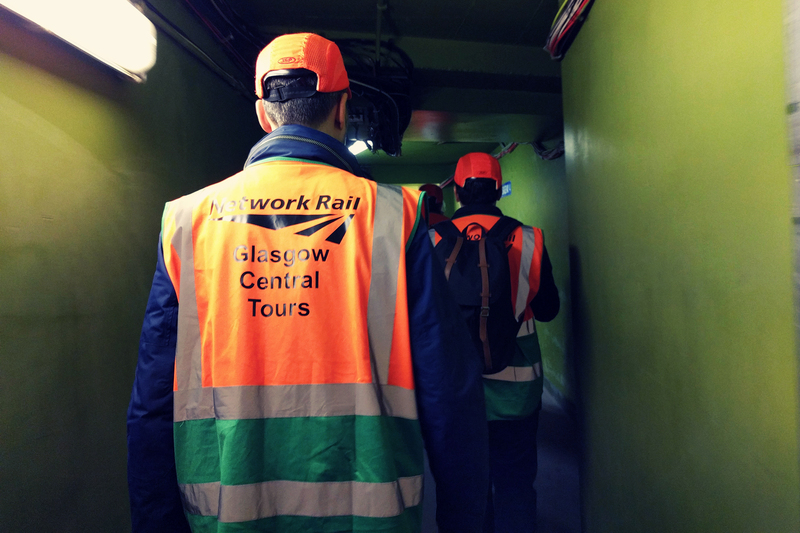 Instead we donned hard hats and flash jackets, and followed a bearded Glaswegian man into the Victorian vaults below the surface of the station. The Glasgow Central Tour was simultaneously the most sarcastically funny and heart-wrenchingly poignant social history tour I’ve been on – the aforementioned bearded Glaswegian was called Paul, and he is honestly the most adept storyteller I’ve ever met. He told us tales that had the whole group giggling away one minute, then sobbing the next (actual sobbing btw), all in the dark tunnels beneath Glasgow Central Station. Not the most inspiring photo, but that’s what made me love the tour even more. There were no airs and graces, this wasn’t some spruced-up sanitised version of history. This was a leaky, dirty, “oh god, I’m going to fall down these rickety old stairs” tour which made it all the more amazing. I highly recommend it, and I’m planning to go back every time I’m in the area. In addition to all of this, I found out that hard hats actually suit me, which has opened all kinds of career opportunities. The flash jacket was less flattering, but it did make us look super important. After the tour, my Google location history tells me we stopped at a Tesco on the way home where I remember complaining that I couldn’t find any Tunnocks Teacakes before finding a separate display for them. Back at the Pineapple, I then overcooked some pasta for dinner which unsurprisingly, no one wanted to share with me. What an incredible evening. I should really get into travel blogging.